I know, I know, this post should've been up weeks ago, but a few circumstances (none of them dire) prevented me from committing time to this blog post. Tips for any freelance writers/designers out there: don't take on four projects at once while still juggling school and work. 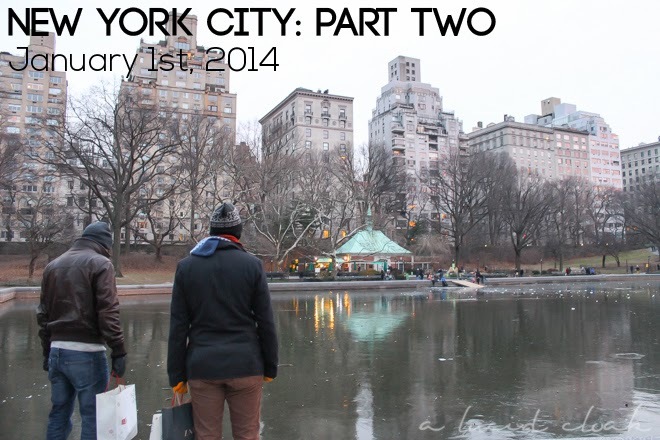 Our second day in New York City was January 1st, which meant that many sights, stores, and restaurants would be closed. Closures wouldn't affect us too much, since we weren't planning on going to any museums, but I still wanted to go to places that I knew would be open. 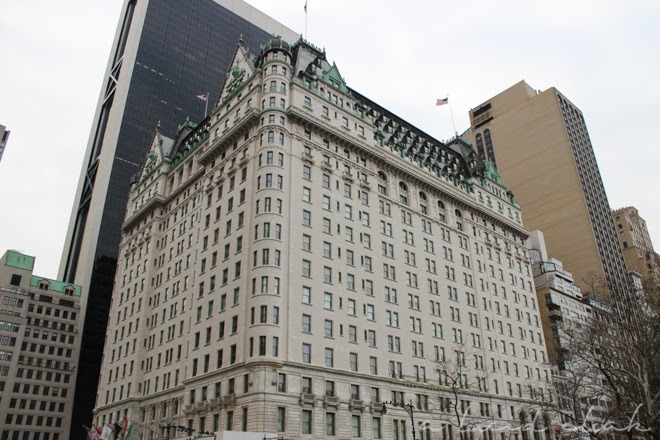 We focused on just a small area of Manhattan: Fifth Avenue, Central Park, and the Upper West Side. All of the big box stores were open, and of course Central Park. 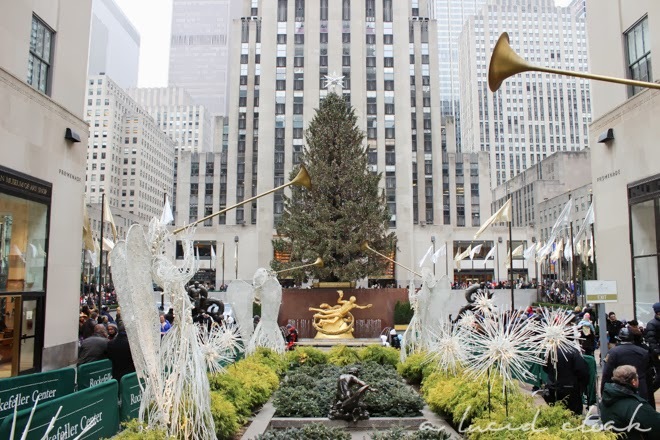 We started off at the Rockefeller Plaza, thinking that maybe we would go skate for an hour or so. That idea immediately dissipated from our minds when we saw the crazy lineup and price tag ($30!). Instead, we satisfied ourselves by losing ourselves in the skaters below us, going round and round the ice like miniature figurines. I snapped the above photo by "illegally" climbing onto the garden path. Behind me, photographers were taking professional (and paid) photographs of tourist. Pretty sure I photobombed some of them. But hey, it was worth the postcard-perfect photo I got. This is possibly my favourite building in all of New York City. It houses the upscale department store Bergdorf Goodman. Last time I was in NYC, my mom and I "shopped around" this store just to see what it was like. There was security everywhere, and concierges and personal shoppers following you around every chance they got. 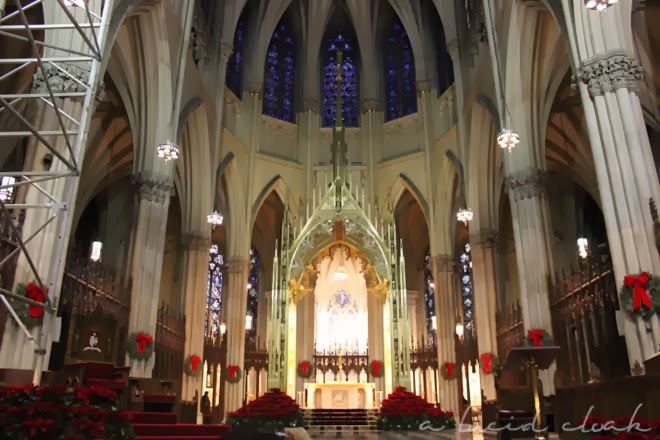 Another worthwhile place to drop by is St. Patrick's Cathedral, located at 5th Ave and 51st Street. There are some major renovations happening to this place, but it's still beautiful and completely free to enter and walk around in. 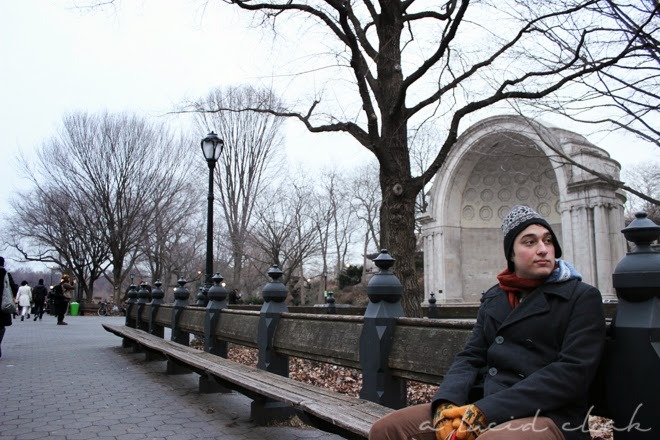 Central Park: the name itself conjures up many thoughts, movie scenes, and TV shows. 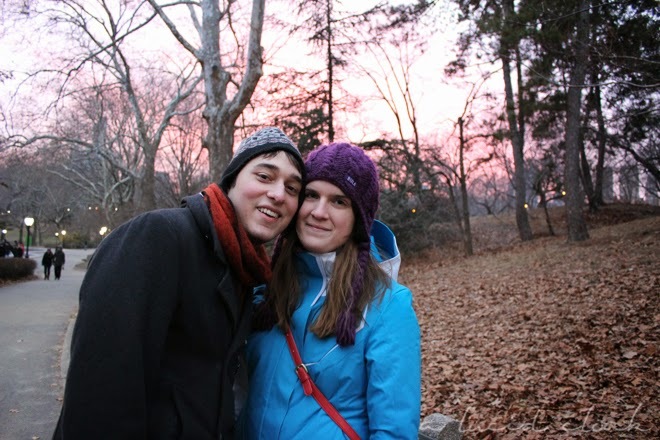 It's an obvious must-see in NYC, so we headed there for a nice stroll through all the paths. A fun thing about the park is that you never know what to expect. 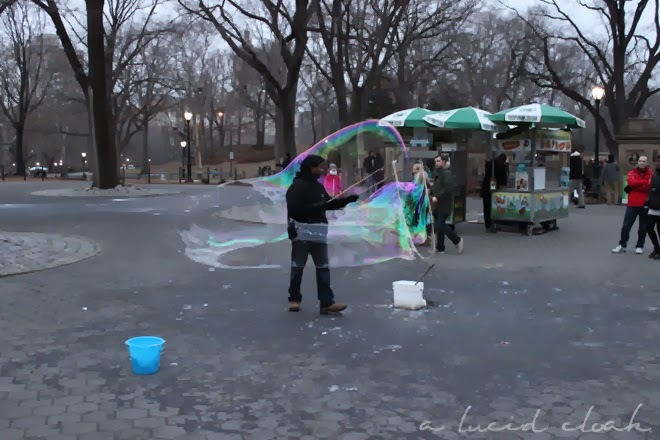 The man in the photo above was making humongous bubbles. It was really fun to stop and watch his bubble making and the ridiculously happy faces of the kids in the crowd. Ah, sunset. 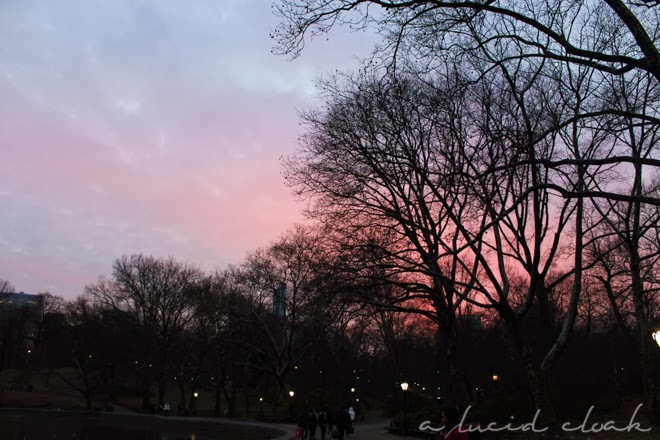 We were lucky to capture the beautiful pink sky just as the day was ending. 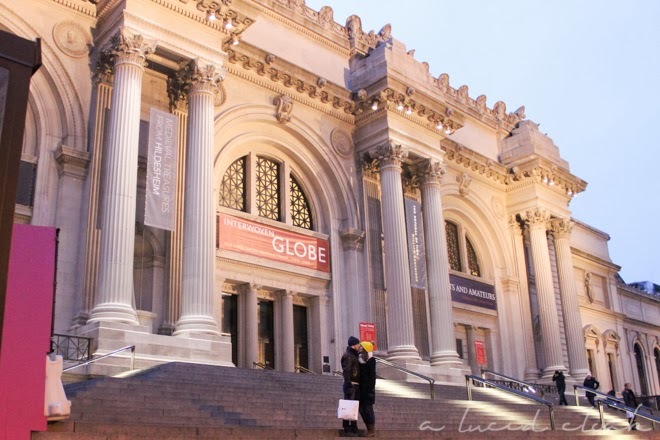 Due to the fact that we only had two full days in NYC, there was no way we could have gone to the Metropolitan Museum of Art without sacrificing all of the other sights in the city. It's worth spending at least an entire day in this gargantuan fortress of art. Even though we weren't planning to go inside, we couldn't pass up getting an iconic photo on the steps. I've been in NYC a few times, and never, ever, have I eaten such delicious food at such a good price. Where is this wonderful haven you may ask? 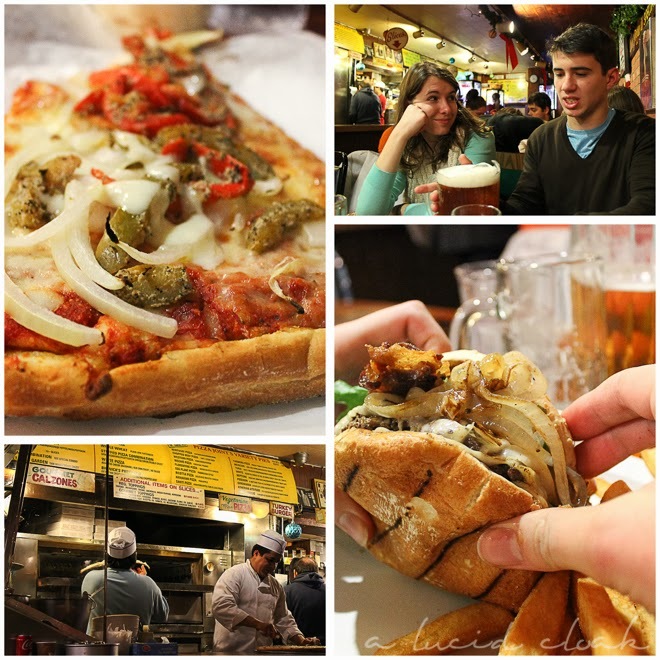 Big Nick's on the Upper West Side! When the four of us were wandering around looking for food, we stumbled into a bar that claimed to have some food on the menu. We had clearly stumbled into the watering hole of only a few regulars. The bar silenced, the bartender looked at us, and he asked: "You guys aren't from around here, are you?" We laughed, embarrassed, and replied, "Nope, we're not!" He promptly pointed us in a direction and said "Go to Big Nick's." Chaotic, cramped, tiny, warm, and delicious: the perfect adjectives to describe this place. Don't miss this little joint when you're in NYC. Don't. Next post, I'll be documenting our all-day whirlwind walking tour of the city. We walked 12 km in one day just to get all the sights in!